Recorded in many 'modern' spellings including Headon, Headan, Headden, Heddan, Heddon, Hedden, Heading, and possibly others, this is an English locational surname. It originates, it is claimed, from any of the various villages called Headon, Heddon, or Hedon in the counties of Nottinghamshire, Northumberland, and Yorkshire. The origination would seem to be the Olde English pre 7th century descriptive phrase 'haep-dun' meaning the hill covered by heather. The Nottinghamshire village is first recorded in the famous Domesday Book of 1086 as Hedune, whilst that in Yorkshire is slightly later appearing as Heldone in the year 1116. Much of the north was not included in Domesday Book, because it was either laid to waste, or in some cases, remained unconquered by the forces of William 1st, even twenty years after the Invasion of 1066. 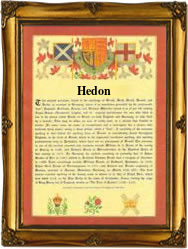 The place known as Heddon on the Wall in Northumberland is first recorded as Hidewine in the year 1178. The meaning here is uncertain. It may be the same as the others, although 'pasture meadow' is another possibility. The surname is first recorded in Nottinghamshire in the list of land owners in the famous Hundred Rolls of 1273. These recordings refer to Gerard de Hedon and Symon de Hedon, whilst a century later Wilelmus de Hedon appears in the Poll Tax register of the city of York in 1379.